Sony is adding five new WUXGA resolution models to its family of laser light source projectors. The new models include the VPL-FHZ120L (12,000lm) for larger venues, the VPL-FHZ90L (9,000lm) for mid-sized classrooms, and the compact VPL-FHZ66 (6,100lm), VPL-FHZ61 (5,100lm) and VPL-FHZ58 (4,200lm). Each model uses Sony’s Z-Phosphor Laser with a blue laser as its light source complemented by a 3LCD optical system. 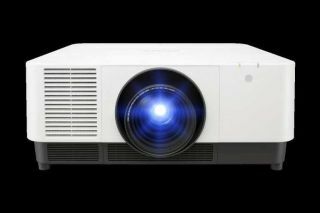 The five new projectors feature auto color calibration, and instant on/off, which can be used to begin presentations at full brightness, with almost no warm-up/cool down time. The VPL-FHZ120L and VPL-FHZ90L use a newly-developed LCD panel with enhanced light resistance, and for the VPL-FHZ120L, anoptical compensator to realize high contrast. The VPL-FHZ120L is intended for auditoriums and conference halls requiring AV solutions to support live performances and ceremonies. The VPL-FHZ90L is suitable for mid-sized classrooms or corporate meeting rooms, including those with challenging ambient lighting. The three new mid-range WUXGA models -- VPL-FHZ66 (6100lm), VPL-FHZ61 (5100lm) and VPL-FHZ58 (4200lm) -- feature compact bodies designed for small to mid-sized rooms, while offering up to 20,000 hours of maintenance-free operation, fast set-up and no need to replace lamps.